Lucas R. Wright’s “The Legend of Waterhole Branch” is a suspense/thriller revolving around treasure hunting. The story follows Hunter Pierce, a smart yet adventurous Wall Street businessman who finds himself face-to-face with a gang of blood-thirsty treasure hunters one night. Citing Hunter’s sudden wealth, the treasure hunters believe Hunter found the treasure and force him to lead them to it. Hunter must think quickly because these men have no problem with killing. Hunter leads them back to Waterhole Branch in rural southern Alabama where he tries to buy time with the treasure hunters as he plans an escape. Along the way, he reflects on his time growing up with his friends in the region and brainstorms a way to get them to help with his escape. Wright’s debut novel is an engaging page-turner with characters you’ll love to root for and love to root against. Hunter is fun to follow, as he leverages his wits against his captors’ mercilessness. 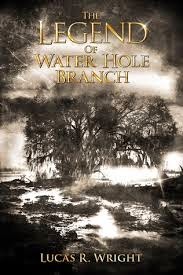 “The Legend of Waterhole Branch” is a must-read for suspense/thriller fans.